New High Tech Screen Mesh Materials Stop Reflection Damage (melted vinyl siding) and Materials that Insulate from Cold Weather. Technical advances in the areas of screen mesh formulation and fiber extrusion have led to the development of woven products that take the place of normal screening materials Specialty screen mesh materials and products do much more than providing shade or keeping insects out. These new materials have saved home owners hundreds of dollars whether it be by saving energy with insulating screen or by preventing reflection damage from windows. 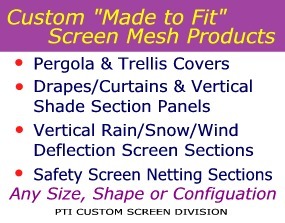 A Specialty Screen That Stops Melted Vinyl Siding, Prevents Damage to Lawn Furniture, Etc. Concentrated beams of sunlight, formed by the reflection from windows (glass doors too! ), can come to a focal point creating an intense heat spot well over 350 degrees. An energy beam hot enough to cause serious damage. 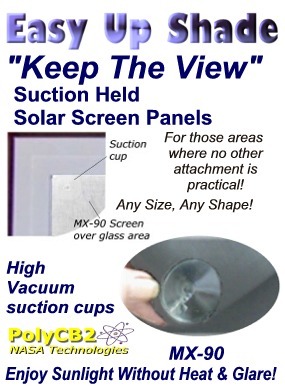 PTI Solar Energy Diffusion (SED) screen, mounted closely to the glass, fragments the reflection thereby rendering the radiated energy harmless. This diffusion process is accomplished by the special extruded shape of the fiber strands making up the weave. High energy beams being reflected from windows is often the result of energy efficient window glass (Low-e glass is generally treated to be highly reflective). However, any glass surface can, when the sun is at just the right angle, create a reflected beam. A slight curvature or slight distortion of a glass pane can become a very efficient magnifier. Read more about this specialty screen here. A Specialty Screen that Insulates from Cold Weather. Any area enclosed with Thermal Weave Insulating screen can be kept warm regardless of outside cold weather. The unique properties of this screen mesh material is formulated to prevent heat and cold exchange. "It's better than adding another room! I seldom close my patio doors anymore" reports one customer. An open doorway or window to your main environment can maintain equal temperature control. Thermal Weave insulates so well that a small space heater on the coldest winter days brings comfortable warmth. Additional information is available here.